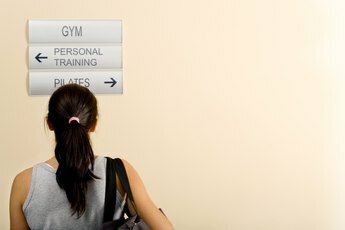 What Types of Exercises Require Foam Mats? Mats provide grip for different yoga poses. You belong to a small gym with a limited amount of exercise equipment, and on one particular visit, you’re dismayed to see the gym packed and all the equipment in use. As you think about turning around and going back home, you suddenly catch a foam mat out of the corner of your eye and realize you don't really have to give up today's workout. Despite their simplicity, foam mats provide the foundation for a variety of exercises. Foam mats are as vital to any yoga class as relaxing music and comfortable clothing, and while some people use cotton mats, foam mats are a fixture in the yoga community. During yoga and Pilates, foam mats, which are available in several sizes, provide cushioning for your body, prevent you from slipping and protect you from dirt on the floor. Standard mats have a thickness of one-eighth inch, but if you prefer a mat that provides a little more padding, you may opt for one that has a thickness of one-fourth inch. Jumping rope and jumping jacks are effective exercises that burn calories and work several muscle groups. They are also effective warm-up activities at the start of your workout. Doing such high-impact exercises on a foam mat cushions your joints. If you plan to perform these exercises at home, visit a sporting goods store and buy a set of foam mats that link together like puzzle pieces. Whether you’re stretching at home while watching TV or working through a quick stretching session at the gym, foam mats provide a padded layer beneath your body and prevent you from having to lie directly on the floor. During floor exercises, foam mats can provide traction to keep your body stable. For example, during a plank exercise, your feet or forearms can occasionally slide on the bare floor, making it difficult to hold the position. A lack of stability during a pose makes it less effective and can possibly increase your risk of injury. If you enjoy yoga outdoors, for example, a thicker mat can provide extra padding if the ground is hard. If you travel frequently with your mat, a thinner mat will take up less space when rolled up and it will be lighter to carry. Always check your mat’s cleaning instructions after buying it. You can usually wipe away sweat with a damp rag, which keeps the mat clean while also restoring its stickiness. When necessary, wash the mat with water and a couple drops of dish soap to clean a dirty mat. Rolling Sands Harmony: Which Thickness Should I Choose When Selecting a Yoga Mat? GaiamLife: Should You Do Pilates on a Mat or on a Reformer? What Are the Benefits of Trampoline Exercises? What Is the Pilates Teaser Move? How Thick Should a Yoga Mat Be? 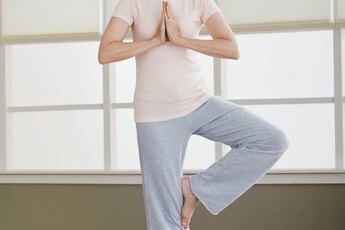 What Do You Need to Practice Kundalini Yoga? Can You Do Aerobic Stepping on Carpet? What Is a Pilates Mini Ball?